Since the start of 2015, several new staff members have joined the Digital Services Section. All of us will be making regular blog posts on History For All the People, so we thought it would be nice for each of us to introduce ourselves, describe our roles in DSS, and preview the projects we’re working on. While acquiring an MA in History, I started working as a student assistant with The University of Akron’s Archival Services, buried in the depths of an old department store. I became acquainted with the “rubber” barons who put Akron on the map: the Seiberlings of Goodyear, the Firestones of Firestone and the O’Neils of General Tire. After graduating, I was hired on to manage the World War II collections involving the Martin B-26 Marauder (a medium bomber used solely for WWII) and various grant-funded projects. The most enjoyable aspect of this position was working with World War II veterans and their families. Assisting in the preservation of their history while listening to their stories was both satisfying and gratifying. As wonderful as the job was, it was only part-time and temporary. I looked for a full-time position and found one at the State Archives of North Carolina. I started here in the beginning of February as the Metadata Archivist. It was a bewildering first few weeks not so much from learning the ropes, but from the ice storm, snow storm, power failure, and below-freezing temperatures that had me thinking I had driven to Raleigh, North Dakota by mistake. My duties as Metadata Archivist include digitizing materials, creating metadata, and increasing public access to government records. I’ve since been involved with several ongoing projects including the digitization of historical Governors’ correspondence and creating access to the North Carolina Supreme Court cases (1967-1981) through our MARS database. I’m also starting work on State Senate audio, helping to preserve and create access to more sessions online. This entry was posted in Digital Collections, News and tagged Digital Services Section, news on April 16, 2015 by kevin. Since the start of 2015, several new staff members have joined the Digital Services Section. All of us will be making regular blog posts on History For All the People, so we thought it would be nice for each of us to introduce ourselves, describe our roles in DSS, and preview the projects we’re working on. The new staff mini-series starts today! I was very excited to start work here at the State Archives in mid-March. Spring is a time for new beginnings and for renewal, for housecleaning and for clouds of pine pollen (a new experience for this Ohio native), for beautiful flowers and for dramatically changing weather conditions. For me, working with archives is like perpetual springtime: I enjoy engaging with new people and new collections, reflecting on my past work experiences, and applying the skills I already possess to new tasks; no matter how many items I digitize and how much metadata I collect, there is always much more to do; and in spite of my cultivated competencies, there are always evolving methodologies and technologies that must be learned. Before coming to the State Archives, I have had nearly eight years of experience working with the digitization, preservation, conservation, and description of library and archival collections. Most recently I worked as a Digitization and Preservation Assistant at the Niels Bohr Library and Archives (NBLA) at the American Institute of Physics in College Park, Maryland. The NBLA has specialized text, image, and archival collections that focus on physics, physicists, and the history of physics. It was gratifying working with the relatively small collections at NBLA where I could immediately see the results of my efforts. The bulk of my experience was gained working as a Digital Scanning Technician in the University Library System at the University of Pittsburgh in Pittsburgh, Pennsylvania. I had the opportunity to work with an astonishing variety of library, special collections, and archival materials, and also to pursue independent research into digital color management and non-damaging scanning techniques for fragile items. Additionally, I was able to attend graduate classes in archives and records management at Pitt’s School of Information Sciences. At the State Archives of NC I have jumped headlong into two digitization projects already underway: correspondence from the Governors’ Papers and World War I correspondence from the Military Collection. I’m eager to make the images and transcripts of these letters widely available to the public – as primary research sources, personal correspondence can provide an engaging inroad to learning about historical events, reveal insights into everyday cultural practices of bygone eras, and present intimate portraits of historical figures. In addition to digitization and metadata activities, I will be writing occasional blog posts for History for All the People, and assisting with web edits on the State Archives of North Carolina website. I know I have a lot of interesting and challenging work ahead of me, and I feel right at home. This entry was posted in Digital Collections, News and tagged Digital Services Section, digitization, news on April 9, 2015 by Kat. Due to inclement weather anticipated for Tuesday, February 17th, the State Archives and State Library are operating under the Adverse Weather Policy. We will open to the public when adequate staffing is available. We apologize for any inconvenience this might cause. This entry was posted in Closings, News and tagged news, Search Room, weather on February 16, 2015 by Ashley. This weekend will be very busy in downtown Raleigh. For those of you planning a research trip to the Search Room on Saturday or intending to take part in the Raleigh Occupied Living History event at the State Capitol or the Finding Your African American Ancestors 1870-1940 workshop hosted by the State Library and State Archives, please be aware that the Raleigh Rock ‘n’ Roll Marathon will be taking place on Sunday. Parking restrictions are being put in place today and street closures will start on Saturday, so please plan accordingly. For more information about parking and streets involved in the race, see this document from the race website. A course map is also available. This entry was posted in News and tagged events, news, Raleigh on April 10, 2014 by Ashley. The Spring 2014 issue of The Charter is now available online. The Spring 2014 issue of The Charter, the Division of Archives and Records newsletter, is now available through the publications page on our website. The newsletter is published twice a year by The Friends of the Archives. An update from Sarah Koonts, the State Archivist, on future plans to promote public awareness of the mission of the State Archives. An article by Frank P. Ward, Jr., President of the Friends of the Archives, on North Carolina maps. Conservator Emily Rainwater provides a look into her work with a 1797 indenture. 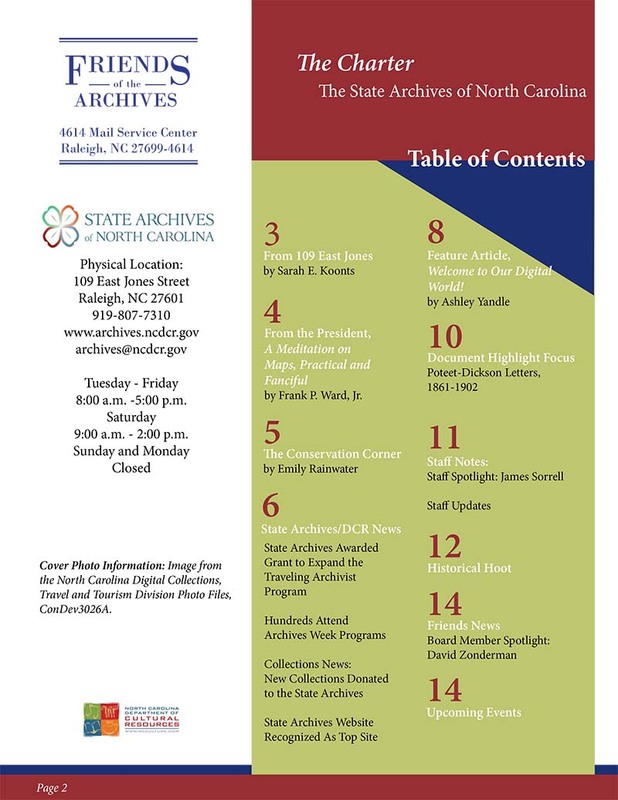 An article by Ashley Yandle, Digital Access Manager, on the North Carolina Digital Collections. A feature by Tiffanie Mazanek of the Digital Access Branch on the Poteet-Dickson Letters. 1861-1902 (PC.1825). A staff spotlight on James Sorrell, Head of the Special Collections Section. As well as news about recent programs and events, new collections, and other staff news. This entry was posted in News and tagged Friends of the Archives, news, newsletters, The Charter on March 27, 2014 by Ashley. James Eubert Holshouser, Jr., who died yesterday at age 78, was governor of North Carolina from 1973 to 1977 and was the first Republican governor of North Carolina in the 20th Century. His official records as governor are housed in the State Archives of North Carolina along with the official papers of other North Carolina governors dating back to 1663. Governor Holshouser’s official records, along other materials in the custody of the State Archives, document his term as governor and shed light on his work towards and advocacy of education, the environmental, rural health care and social issues such as his support for the creation of Soul City, the new town project started in Warren County by former civil rights leader Floyd McKissick. This support is reflected in this proclamation establishing November 9, 1973 as Soul City Day in North Carolina. Learn more about Governor James Eubert Holshouser, Jr. on NCPedia. View photographs related to Gov. Holshouser and Soul City on our Flickr account. This entry was posted in News and tagged Flickr, governors, news, State Agency Records on June 18, 2013 by Ashley. Traffic will be affected downtown for the World Beer Festival The 200 and 300 blocks of East Martin Street, between Blount Street and Bloodworth Street will be closed from 9 a.m. on April 12 until April 14 at 5 p.m. The 200 block of South Person between Martin and Hargett from 2 p.m. on April 12 until 5 p.m. on April 14. The 300 block of South Person between Davie and Martin from 3 p.m. on April 12 until 5 p.m. on April 13. The times allow for setup and breakdown of a large tent and other displays. The actual event will be held on Saturday, April 13 from 12 p.m. until 10 p.m.
April 13: A portion of the 300 block of West North Street next to the Hibernian Pub to a point just east of 301 W. North Street will be closed from 7 a.m. until 11 p.m.
North Street between Boylan Avenue and Glenwood Avenue will be closed from 7 a.m. to midnight. This entry was posted in Closings, Events, News and tagged events, news, Raleigh on April 12, 2013 by Ashley.